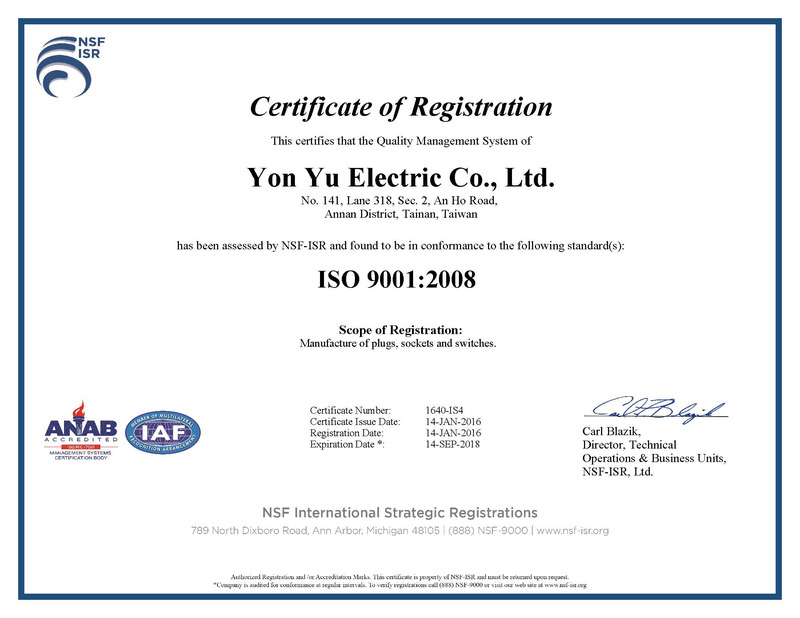 Yon Yu Eelectric is found in 1979 and main character is manufacturing industry. Our brand is "LONG KUANG". The range of main products include NEMA Locking Type Plugs & Receptacles, NEMA Locking Type connector Plugs & Receptacles, Ground Type Plugs & Receptacles, Switch, Stainless Cover, Fuse Seat, Terminal Plate, and etc. We use professional design and developing ability, product diversification, also welcome OEM. Our factory locations in Tainan city, Taiwan. We duct into ISO 9001 quality-identify system in 2000 to enhance producing management, products quality and take serious quality control. The target of our management is "quality fist, satisfy customers' need", expect enhance our producing management and product quality. We insure responsibility to customers and reach the objective of on-going operation.